I've always been a bit intrigued with St. Patrick's day. Perhaps it's because I've got some Irish roots. It could also have something to do with some over zealous teachers when I was in elementary school making a big hub-ub about the holiday. I remember that we had a little Leprechaun visit our room, and all though none of us children saw him he managed to leave glitter and rainbows in his wake. As far as I remember he did some rather naughty things too. Turned desks upside down and even turned our milk green. Those mischievous and sneaky little Leprechauns! When I started making corned beef a few years back, I began doing so with the pre-brined corned beef briskets that you can buy at the store. But, this year I wanted to try and do something a little different. I began to do some research into the matter and found that - YES, you can corn your own beef and that it is really easy to do! Corned beef is basically just a cut of brisket that has been brined in salt, sugar, and spices and then slow cooked to perfection. The spices that you brine in are pretty much exactly what you will find in any salt-free pickling spice; the only difference being that you've got to add in some dried dill. I found my pickling spice in the spice section of my grocery store and it was surprisingly cheap when compared to actual 'corning' packets. Go figure. I lightened this traditional home-corned beef recipe up by swapping out some of the sugar in the brine for all natural sweetener. I also used a much leaner cut of beef than brisket. Any roast that is marked as 'round' will be your leaner cuts that you'll want to choose from. Since there's so much less fat on any 'round' cut of meat, I decided it would be best to cook it in a stout to help tenderize and reduce any toughness. By the end of it, my home-corned beef was so juicy and tender that I couldn't get it out of the crock pot in on piece. I actually had to use a spatula to get the meat out of the juices and onto my cutting board. The meat was so fork-tender that it just kept falling right apart. Since I brined this myself, I decided it would be best to leave the salt and sugar off of the nutritional values below. This is because there is no way that I could calculate how much of either were soaked up into the meat in the cooking process, and I didn't want to leave us all with a 2k number under sodium since you're not actually eating the most of the brine. This is just something to keep in mind if you're a hard-set number cruncher! *The salt and brown sugar in the brine is not accounted for in the nutritional information below as there is no way to tell how much of either are actually absorbed into the meat during the process. Bring the water, salt, and spices to a boil in a large pot. Remove from the heat once boiling and add in the ice. Set the pot into the fridge until it comes to at least room temperature, if not cooler. Once cool, place the beef into a large ziplock bag (I used a gallon size) and carefully fill with the cooled brining water; get as much air out of the bag as possible. Get it? The brine needs to be quite cool before you put the meat in it! Lay the bag out flat in the refrigerator to sit and brine for 3-5 days. I tend to flip mine from one side to the other each day. Once the beef has brined for a few days, remove it from the ziplock and discard the brine. Yes, rinse it off under some running water. I know this sounds a little strange, but trust me. Doing this helps to remove some of the unnecessary salt/sodium. If desired, you could then stop here and use this corned beef however you see fit; cooking it however you prefer. Otherwise, continue on with the crock pot slow cooking method below. Heat a large skillet over high heat and place the rinsed beef into the hot pan. Sear off all sides and edges of the meat. 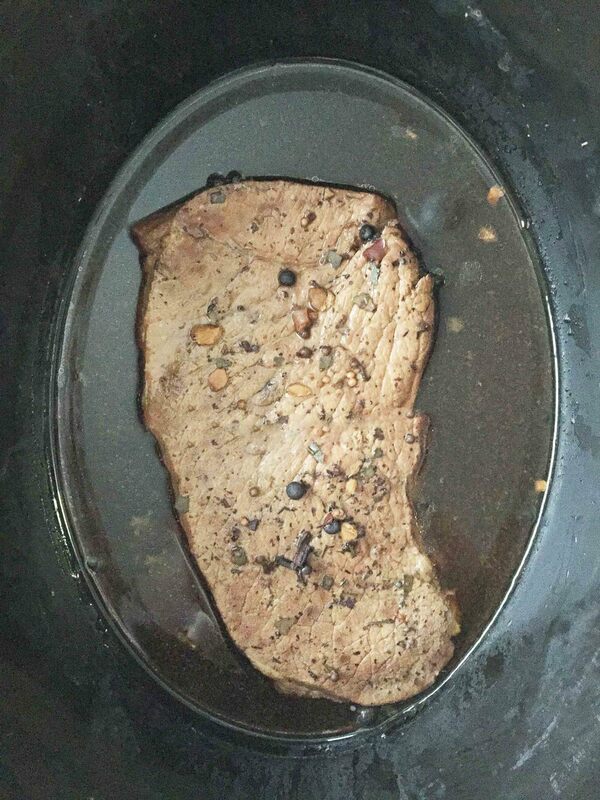 Transfer the beef to the bottom of a slow cooker and add in the beer and spices. Secure the lid on the slow cooker and set to cook on high for 4-6 hours or on low for 6-8 hours. Once done remove the meat from the slow cooker, divide evenly into 8 portions. Feel free to discard the remaining beer broth in the slow cooker or use for a sauce or 'au jus' to dip and keep the meat moist.